Conveniently located just a half mile from the JFK airport, this hotel is perfect for flying in or out and for guest looking to be near Jamaica New York’s Corporate offices. 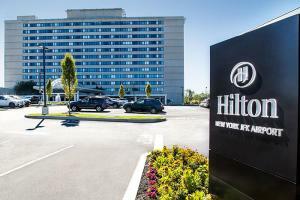 Hilton New York JFK Airport offers free shuttle service, an indoor pool and complimentary business services. Room amenities include a mini-fridge, work stations, comfortable exclusive serenity beds and more. Dine and unwind at the 144 restaurant, offering everything from traditional favorites to modern cuisine.